Welcome to the Huenna Kitchens Website. When it comes to making the important decision of buying a Fitted Kitchen, Huenna is the place to come. Over the last thirty two years Huenna Kitchens has established a reputation for specialising in superior bespoke kitchens. Each Kitchen we build is unique, designed for your indivdual needs and preferred style. Check out what our Clients have to say. Testimonials. We guide every customer through all the steps involved in the Kitchen process. Once you decide on your design, we custom make your kitchen to the exact specifications in our Factory. 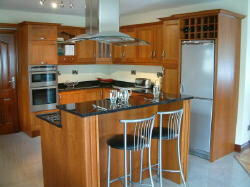 Once it leaves our Factory it is installed in your home by one of our highly experienced kitchen fitters. Our dedicated sales team will be on hand to over see the customer through all these stages enabling us to give every client the personal touch. Take a browse through our website and see the wide range of our Fitted Kitchens including Oak, Walnut, Cherry, Birch and Pine with Painted, Framed and Round doors. These can all be seen in our showroom in Castleblayney. We manufacture for customers all over Ireland.